How can we design IoT toolkits to enable new ways of knowledge sharing within communities? Enticed content creators to share information differently from conventional media through the constrained format of content and metaphor-based design. Integrating digital information about places into the physical world allows users to experience it in the moment and in its real-world context. 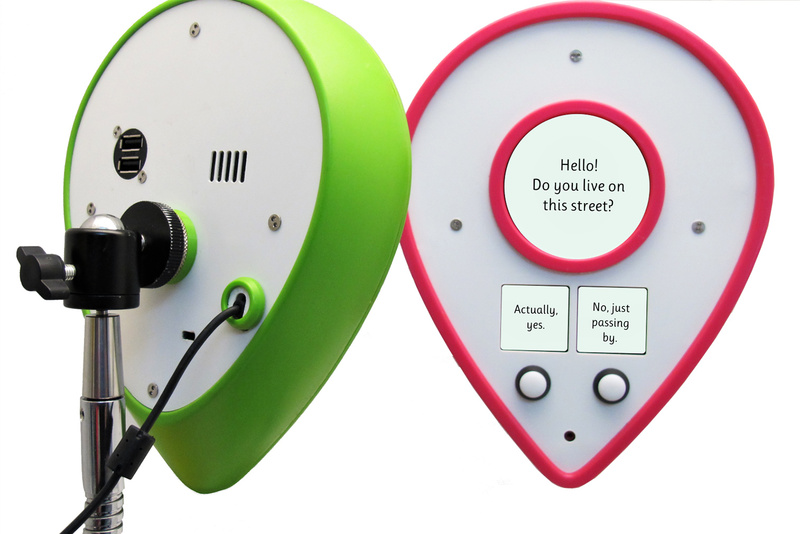 Drawing on physical computing and IoT technologies, Pinsight is a novel platform that enables local communities to create and share digital content about places through tangible interactive devices that can be placed in and moved around physical spaces, such as streets, urban districts, parks, public buildings. 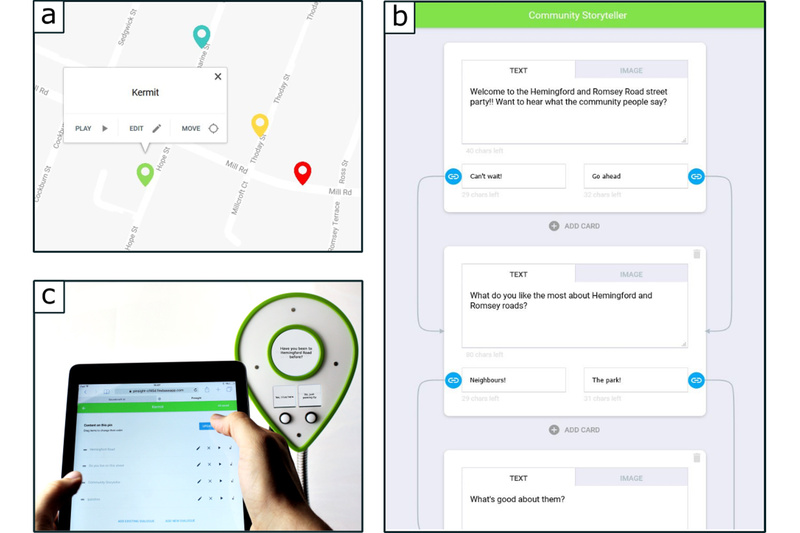 This enables the people connected to those places to tell stories, share ideas, and collect opinions relevant to spatial and social contexts. Pinsight is comprised of a series of eye-catching interactive tangible devices, ‘Pins’, and a web interface for authoring their content. The Pins resemble the shape of digital location markers to indicate their situatedness. They present a question or statement and two response options that can be selected using one of two buttons. Upon selecting a response, the next item is displayed, allowing for a conversational-style presentation of content. The authoring interface presents a map of the area in which the (physical) Pins are placed. Clicking on the digital version of the Pin brings up a menu that allows the content creator to Edit or Preview the Pin’s content. In the Edit screen, new content can be created or existing content can be added from the cloud. A conversational format can be constructed by linking response options to next items. We conducted three case studies with a set of four Pins. The aim was to explore how Pinsight can be used to share digital content in-situ by different user groups, and how the socio-spatial setup affects content creation and consumption through this platform. (QEOP). It was used to engage visitors to explore activities at the event and key places within the park. The event organisers and stakeholders decided to give each Pin a different role with respective content about the festival, the park, future events, and visitor feedback. Throughout the afternoon, the Pins attracted ~ 350 individual / group interactions with a variety of demographics. The visitors personified the Pins as they “talked” to them. The curious ones hunted multiple Pins for fun. The second study took place at a historic street district in Cambridge. Seven volunteers from the local history society participated in a content creation workshop. They created stories for four locations (The Six Bell Pub, Bath House, St Phillip’s Church cafe and Romsey Mill) and uploaded them into different Pins, which were then deployed for two days at the corresponding places. Pinsight engaged local community members to curate history in interesting ways that differ from conventional media. The reaction of passers-by differed across locations, reflecting the effect of context on their engagement. 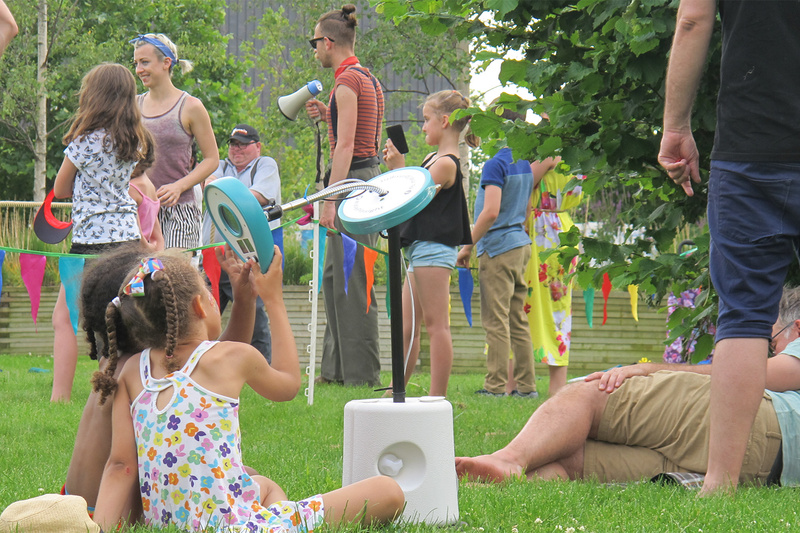 The third study took place at a street party in Cambridge and explored ad-hoc content creation in the local neighborhood. The party attendees created short and humorous questions and answers about the local life and people. Passers-by were intrigued by the content and the ability to add on to it on-the-fly. In the end, a community dialogue was co-constructed and shared across the Pins, allowing Pinsight to mediate a collective experience.